Kathy @ I Am A Reader, Not A Writer: http://iamareadernotawriter.blogspot.com/ . May of 2008, we found out our 2 year old son had an Autism Spectrum disorder called PDD-NOS. My world crumbled. The A word is up there with the C word and the last thing a parent ever wants to hear. But, we got help early and never quit advocating for him. I'm happy to say, three years later, our little buddy is going to be entering Kindergarten in the fall with typical kids. It's been a rough road with 40 hour week in-home therapy, a special diet and just the fact he works so much harder than most kids his age to train his brain to learn. I'm so very proud of him and his accomplishments. No or little speech by two years of age. Doesn't respond by looking when people say their name. Doesn't play with toys appropriately (lines things up, collects odd items). Getting treatment early is key (before age 3). Don't wait! Most school districts can point you in the direction of early intervention services and there's federal funding for in-home therapy called ABA - Applied Behavior Analysis. My favorite aunt surprised me with a pair and I bawled like a baby. They'd make a great gift to anyone who loves someone with Autism. One good thing about autism coming into our lives is that I had to find another avenue to be creative and I turned to writing. It became the lemon aid out of the lemons and it makes my heart sing when my son says "That's your book Mommy?" cause he didn't say "Mommy" until he was 3-1/2. Please tell me how autism has changed your life (or someone you know) and leave your email in my comments to enter the drawing (US only please). I just ask you follow my blog. I"m not entering to this contest, but I want to tell you that one of my best friend cousing has autisim and he touch my soul becouse, he never get to close to people but one day he get close to me an out of no where he gime me a hug, thas Is the most beautiful and sincere hug I ever fell, unfertunelly he pas away a few year ago and it was sad couse he was a great and intelegent kit, for me he was and always well be the angel that gives me the mos beautiful hug. Autism hasn't exactly "changed" my life, but rather is my life! Both my son and I are Aspies! Autism is not something that I deal with myself on a daily basis, but I have a friend that is very dear and precious to me, she has a child that has Autism and struggles everyday I`m sure. She continues to be strong for him and those around her. She has not only inspired me to follow my dreams of being a dog trainer but she inspires many others with her work.I hope she knows how much she truely means not only to me but to those who read her incredible stories. I wish you the best my dear friend, I always support you in all you do. I have entered every contest you have ever had, but this is one that I will not enter. I can`t wait to see who wins this, good luck all! 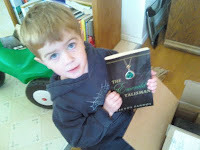 My 7 year old grandson is in the autism spectrum, leaning toward aspergers. My daughter has been incredible with him. I remember the day she came and told me what the doctor said, I started crying and probably cried on and off for days. Not being familiar with the disorder all I could think of was he'd never be able to live a normal life, grow up, get married , have children. It was like the death of all hope. 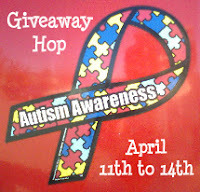 That was last year, since then I've learned more about autism and he is getting help now with his areas of difficulty. He is a brilliant little boy who they tested for the gifted program but he didn't finish the test. His classmates are wonderful with him, they are very protective of him, I was so afraid he would be made fun of and I'm sure that's probably coming up down the road at some point. Kids can be cruel at times, well for that matter so can some adults. Sorry for rambling on but this is near and dear to my heart. Thank you so much for participating in this hop to educate and inform people about autism. Thanks for your comments. They've each touched my heart and I'm crying again cause I can identify and glad I'm not alone. These kids are near and dear to our hearts and I hope one day the puzzle piece will be found! Not all kids break through like my little guy has, but don't quit trying to reach them. They need it! This is such a great giveaway hop. Thank you for participating. I don't know anyone with autism, but my sisters all work with special needs children at local schools. There is just something special about special needs kids. I love the awareness this giveaway hop is generating. Knowing more about autism takes away the fear factor. I also appreciate the warning signs. As a parent, I'm always trying to make sure my son is healthy and happy. deborah@deborahandreasen.com - I'm a follower. My nephew is autistic and he has changed my life. I have watched him struggle, learn, grow and cope. His life is not easy, but his family is so supportive. He is one of my favorite people in all the world! I worked with a couple of autistic children at the day care I used to work at. They brought so much joy to my life with just a smile, but they also taught me patience. I also have never known anyone with autism. I have seen the shows on television and especially on the blogs in the last few weeks. Everyone is in my prayers for the problem. I think it is wonderful that all these blogs are bringing out this struggle and trying to help by letting us know what can be done. My IT co-worker's son has severe autism, hearing this dedicated father speak of his son & their family's struggles is heartbreaking. Thank you for spreading awareness about Autism! Best wishes and thanks for a chance to win this giveaway! thanks for the support! i'm part of this hop as well. last night i went to a prom for my mom's special education students...they had a blast and it was so sweet to see them all dressed up and smiling! In the past few years I've been diagnosed with Asperger's. While having Asperger's isn't exactly the greatest thing in the world knowing what I have is good. It's good to answers for why I am the way I am. I'm an elementary librarian. I have a number of students with Autism. I find that the teachers/paras who work with these students are true angels. They are very inspirational. Recently, my heart just burst when one of our students, who does not often participate in activities, took part in a school concert. He stood right on the front row and sang his heart out. My son who turned 13 last Sat.!!! Has asperger's syndrome and it changes everything when you find out. But he is such a bright and very sweet boy. He is on the A honor roll (in special ed.) and a great bowler and plays the baritone! He is a joy and I wouldn't change a thing even if I could!! my neighbor's child has autism. We moved in when he was 4 and he is now 17. I have watched him develop and grow. It is amazing to me to see how his loving parents have made every effort to give him a "normal" life. For me, I believe it has made me more aware of special needs children. My son was speech delayed and didn't say mommy until 3 as well. I rejoice with the parents of special needs children. I have three cousins with autism, so autism awareness is dear to my heart. My best friend has autism and although it's slight and barely noticable, it puts a damper on his social activities. I try to encourage him to interact and we often have a rewarding time together. His autistic friends are easygoing too and I've grown to think of them as my own family. A childhood friend of mine's brother is autistic. Back in the day, not much was known about autism so he was diagnosed as mentally retarded. Thanks so much for participating in this hop and supporting such a worthy cause. My son is 3 and he is on the spectrum. His needs have changed everything for our family. He needs certain schedules and meds at certain times. He doesn't do well with large groups or loud noises. I follow on GFC. Watching my close friend raise her Autistic son has really humbled me. They are both simply amazing! My grandson suffers from Asperger's and is doing well with support from his family and his school teachers. He faces many challenges and works hard. I don't know anyone with Autism. My cousins son has Angelman's Syndrome. He is such a joy. These illness effect the whole family. My husband and I were at a family get together with my cousin. He was standing with my husband and started to cry, thanking my husband for caring about his son and accepting him as he is. Most people shy away from the unknown. They just don't understand everyone needs to be loved and given every chance to succeed maybe not the same way as another but still the chance. Were all gifts from God. Thank you for spreading the word. GFC follower. My friend has a three year old with autism and hearing about the hours of learning activities they do at home and the amount of therapy they attend both here and an hour away just astounds me. If everyone was as lucky to have a parent as dedicated as my friend, the world would be a much better place! I don't know anyone with autism, but hearing all these stories is really touching. I'm glad to be learning more about autism and its symptoms. There's something special about hearing all these. I'm glad that this hop is generating more awareness. My nephew has Asperger's. I was his "nanny" (basically) for almost 3 years. I have to say, while he has his bad days, he's amazingly sweet and smart and talented and everything you want for your child. We're just discovering he has an amazing aptitude for music. He's a fantastic kid, and I know that furthering the knowledge of autism will only make his life better. Thanks for this! My nephew is autistic. Thanks for spreading awareness. I don't know anyone at the moment who has ASD but my daughter is displaying some "signs". I'm hoping that this is just my mommy senses in overdrive but I know that, either way, I can get through it by having wonderful online resources (especially moms like yourself!). CONTEST IS NOW CLOSED! Winner posted shortly! Thanks everyone.